After getting home from a walk this afternoon, some of the workers were up on the new Dollar General roof. I politely asked if they were going to pick up all the garbage they have been just leaving every day on the ground. One of the men said "well we should but it has really been windy and they would have garbage that they would have to pick up every day." My reply was that I also have a job and that it is not fair to have to come home and clean their garbage out of my yard every day. His reply back was that they work 12 hour days. I am perfectly aware of how many hours and days they have been working across the street. That includes Saturdays and Sundays and even Easter Sunday. I don't care and I think that was a rude response. Mike and I have worked hard to make our yard nice. So I take it that they really could care less how it looks around this new building or in the buildings and homes around it. I sure hope this is not how it will be when the store opens because Mike and I will not put up with it. 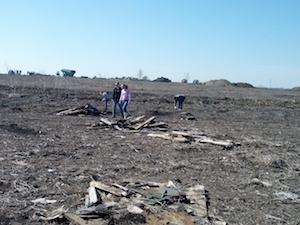 Thanks to the volunteers who came out to help clean up the field north of Minonk from the tornado. The 4th of July committee is looking for large tent for the band in the beer tent uptown on the 5th of July. Does anyone have any connection to a tent rental business? THE ANNUAL FFA PETTING ZOO will be Friday, April 11th from 8:30 to 2:30 PM at Fieldcrest High School in the AG Building. There will be animals, tractors and several activities for all to enjoy! COME CHECK OUT WHAT FFA is all about!!! This happens frequently, is there anything that can be done? According to the recent City Council meeting, we have money in our Tif account to proceed with the development of the uptown plaza. I'm not opposed to improvements to the empty lot uptown; I just think it should be done on a lesser scale at a lower cost. If the town can afford $81,000 for a new plaza/park, I think that they should first take care of the parts of the town that need fixing. For example, the Filger Library roof & back elevator area are in very bad shape. The library is a city building, and the city should take care of it. With the roof leaking & the basement flooding, there will soon be so much mold & mildew in the library that it may present a health hazard for the employees and the patrons. The city wants the library to pay for a new roof out of their operating money. That money is used for library expenses, not building repairs. We lost our city swimming pool because of a lack of maintenance, and if we are not careful, we might lose our library. 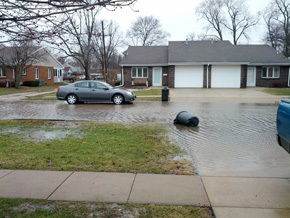 Tif money is tax payers' money. Please use it wisely. Minonk's Town Wide Garage Sale is this Saturday, April 26 from 8 am until 2 pm. There are many items listed on the map which will be available on this website hopefully on Wednesday at the latest Thursday. Thanks to all who participated and good luck with your sales. Get your 3rd Annual St. Jude Bingo Night tickets! We still have around 25 Bingo Night tickets left. Call Beth Hakes at 432-4026 to purchase today and guarantee a seat to this fun, family friendly event! Adults (age 11 and older) are $20. Kids 10 and under are $10. Everyone receives a drink and snack as a thank you for coming, but we also have door prizes, and of course our really great bingo prizes and raffles. We will also have a bake sale, and gondola, chips, drink, and cookie for $5.00. Doors open at 5:00, bingo will begin at 6:30. Call Sonja Frei with any questions. 432-2139. Thank you for supporting your Minonk to Peoria St. Jude Run team and St. Jude Children's Research Hospital! The Minonk Police Department will be participating in the National Take Back Initiative on Saturday April 26, 2014 from 10:00 a.m. to 2:00 p.m. residents are encouraged to clean out their medicine cabinets and drop off any expired, unwanted, or unused medications. All medications will be accepted, including prescription or over the counter pills, capsules, ointments, and liquids. Help support the FHS Renaissance Program by test driving a car. In conjunction with girls softball double-header in Minonk this Saturday 4/5 Geiser Ford in Roanoke and Ford Motor Company will once again donate $20 to FHS for each test drive, up to 300 drivers or $6,000. Wenona baseball field will also have a vehicle to test out on Saturday. You may also stop by the North end of the Dollar General parking lot in Minonk between 9:00 a.m. And 3:00 p.m. on Saturday. Come out and support FHS and the Renaissance program. Thanks in advance! The sales are advertised in the following papers: The Woodford County Journal, and the Woodford Star; Streator Times Press; Toluca Star Herald; El Paso Journal and Craigslist. Each and every ad has a date / time of the sale and that the sales will be posted on this website for everyone to see.